Get the most from your next lead nurturing program. Plan for success with this free white paper. I agree to receive future emails from Spear Marketing Group including (but not limited to) information on new marketing content and upcoming events. 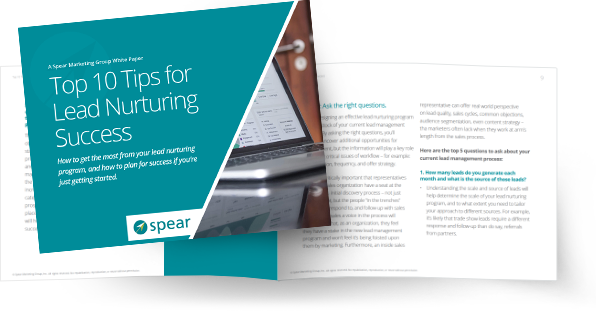 If you're new to marketing automation, if you're just getting started in lead nurturing, or if you're concerned that your lead nurturing program isn't everything it should be, read this paper before you take the next step. Lead nurturing is not a goal. Lead nurturing is simply a means to an end, and unless you define what that end goal is, your program will simply develop organically, or randomly, or worse – and in six months, your shiny new marketing automation platform will look like a very expensive email broadcast engine. Spear Marketing Group is a full-service B2B demand generation agency that helps B2B technology companies generate, nurture, and convert sales leads to revenue. The firm's unique, holistic approach to demand generation blends strategic expertise, creative flair, and a deep understanding of marketing technology to drive measurable results across every stage of the lead lifecycle: lead generation, lead nurturing, and customer marketing.